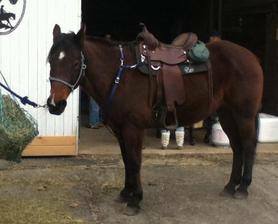 Howdie is a reg QH gelding that is here to learn how to play the seven games, have fun, and learn to enjoy Harry. Howdie has had lyme disease in 2010 went through treatment, and has tested negative this past spring 2011. Having had lyme Howdie has been off and on lame, but using the "red" light consistantly latelty has helped him to show no signs of lameness:) Look for him in the lessons with kids, and out on the trails this winter. Howdie has enjoyed Moony's company actually and is moving much better in the front. He went on a trail by himself this Feb '12 and was a gentleman in every way. The bone setter will be here in the beginning of March to look at Howdie, helping to improve his gaits, and flex. April of '12 howdie ventured to an obstacle clinic, he did very well, only didn't care for the automatic bubble machine:) Too many floaty bubbles! Howdie has become a favorite of many students here, he is patient and very willing to play! Danielle is playing daily with him, red lighting as they go. Oct 12' Danielle and Howdie won first place at a Trail Trial in Livermore Maine!!! They negotiated 21 different obstacles, which included dragging branches, tarps, bridges, and ground tying. Jan 2013 Howdie is doing great, loves all the kids, and the snow.... keep catching him rolling around in it! He is also a fan of warm mash on cold days. Howdie has been keeping Moony and Arizona in line this spring. They make a really neat herd to watch. Howdie is continuing to expand his show and trail carreer with us. 16' Howdie has really improved on his movementdue to being on Protandim, he's sounder and just overall healthier. He loves his lessons especially the treats of apples and carrots after. He also enjoys eating the Jeruselim Artichoke in the front of the barn. The Protandim has made such a difference on the quality of his life with the Lyme, I'm in awe.